I sat for too long staring at the photo above trying to best define what pimento cheese is. 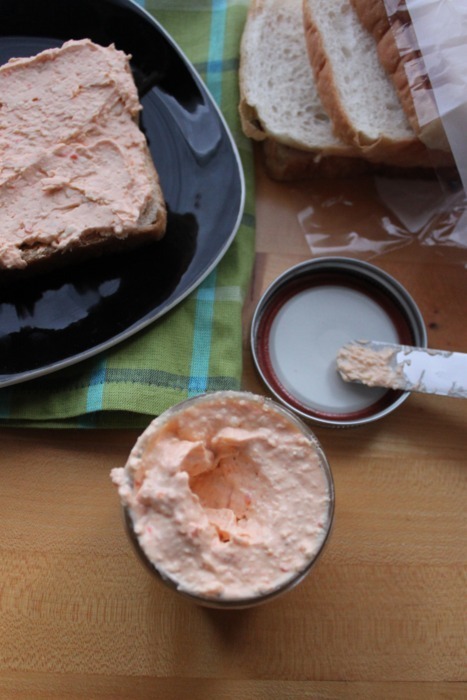 Plainly, it is pimento peppers that have been combined with mayonnaise, cream cheese and cheddar cheese. Additions are negotiable but include black pepper, cayenne, red pepper flakes, Worcestershire sauce; and, in certain parts of the South (Texas and Alabama, I believe), pickles. Sometimes the peppers are jarred and other times fresh roasted. It is often spread on white loaves and served as sandwiches, or with crackers as a snack, and in celery as an appetizer. It is amazing in scrambled eggs. Tonight I proclaim it to be something above and beyond any of its flavors and functions and, call it a sidekick. With pimento cheese in my fridge, I always have something to serve company (with crackers and sweet tea), we always have something to slap on bread and eat on Saturday in between cleaning the yard and walking Miles, or as Brian prefers we always have a dip for Frito scoops. 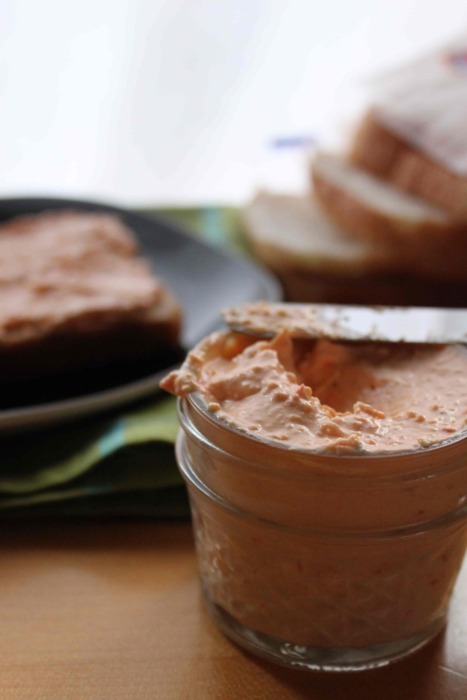 With pimento cheese, you will never be alone in the kitchen. Heat your broiler to high. Slice the ends from the red peppers; discard the seeds. Open the peppers by slicing from top to bottom and remove the white rib. Broiler the peppers (ends, too) on sheet pan until blackened, 5 minutes. Remove to a paper bag and cool for 5 minutes. Remove the blackened skin from the pepper by rubbing with a clean kitchen towel. Finely chop and set aside. Combine the cream cheese, mayo, red pepper flakes, black pepper and salt. Add the cheddar cheese and chopped pepper and combine. Store in an glass mason jar in the fridge for up to a week.